This is Down On The Street Bonus Edition, where we check out interesting street-parked cars located in places other than the Island That Rust Forgot. We're heading back to New York City, where Dolo54 shot this interesting pair of vehicles for us a couple months back. Yes, a vintage XKE and a jaw-dropping van that rivals even the Spinellimobile for the world-record Custom Van Awesome-O-Meter™ reading. Make the jump to see all the photos and read Dolo54's description. Thought I'd send you these pics even though they didn't turn out so well. Sorry about the terrible camera phone quality. It was raining on/off and the light was terrible. The van was on Prince St. in Soho, it may be there again and I'll try to get better pics. I think it was an 80s Econoline, but I'm not sure what model. All labels were shaved. The rear lights look custom. The stained glass window was beautiful. The pics are mostly blurry, but the airbrush work was top-notch, 80s style. 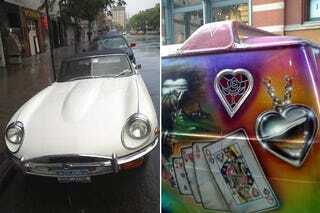 The E-type is the 2-seater, 1960 something, parked on Orchard St and Stanton in the LES. Beautiful mint condition in and out. Unfortunately it started pouring as I was taking pics and couldn't get any more. It has a Hamptons window sticker, so I probably won't see it again.